We let Chesterfield know transit is a priority! 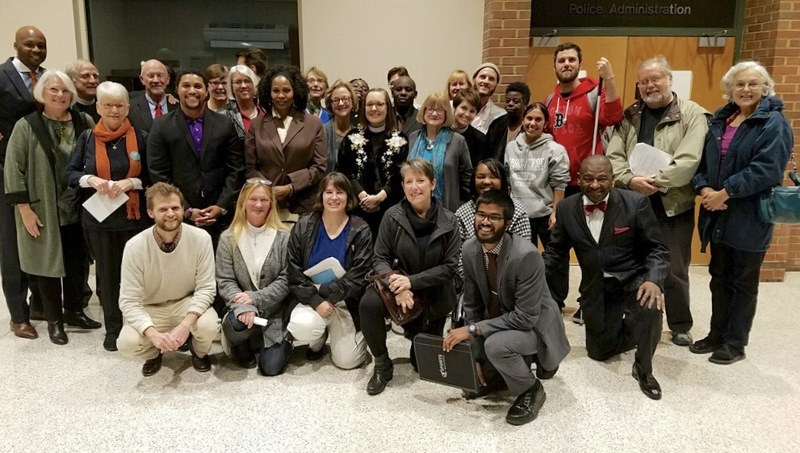 This past Wednesday, the RVA Rapid Transit crew had the opportunity to attend and speak at the Chesterfield County Board of Supervisors meeting in support of regional rapid transit. You can watch our five speakers each talk about different reasons we need public transit (scroll down in the list of agenda items until you see "Fifteen-Minute Citizen Comment Period on Unscheduled Matters). Thanks to everyone who spoke and everyone who came out to show the Board of Supervisors that transit is an important priority for Chesterfield County. Moving forward, there are many opportunities to get involved in the work for regional transit! We need folks from Chesterfield, Henrico, and Richmond City to attend and speak at their jurisdiction's meetings. If this sounds like something you'd be interested in, sign up on our website. We'll get in touch and even help you work through talking points. It's an easy—and incredibly important—way to get involved! If you've got other ideas or suggestions, shoot us an email: info@rvarapidtransit.org. The City hosted two Pulse Corridor Plan public meetings this past week to collect feedback on the development that could/should take place a quarter-mile walk from the Pulse. You can download all of the materials (including sweet maps) from the City's website. If you've got thoughts on the particulars of a certain intersection or sidewalk or BRT station, now is the time to let the City know! Just contact Kathleen Onufer with all of your brilliant ideas and suggestions: kathleen.onufer@richmondgov.com. This Saturday (November 19th), the Virginia Historical Society will host a transportation-centric tour of the museum. You'll have the opportunity to learn all about transporation's role in Virginia's history. The state approved a plan to rework the intersection(s) of Broad Street and I-95—which is great because that area is a total disaster. CHPN has the details. Keep in mind that the Pulse turns from Broad onto 14th, so this plan will have at least some impact on our BRT. Also included is a pedestrian overpass that allows for safely crossing the onramp to the highway. Interesting thought: What if instead of an overpass we had automated vehicles ferrying people up and down that stretch of Broad Street? There's some drama in Cleveland, home to one of the nation's better BRT systems. The City recently decided to ban bus traffic in the newly-redesigned Public Square. Unfortunately, they told the Feds (who paid for a $142.2 million chunk of their BRT system) the square would be used as a transit hub. The FTA put them on notice in August and now Cleveland must prove that bus traffic will not suffer. Stressful! Work continues on Montgomery County, Maryland's BRT that's due to open in 2020. There's even a contest to name their BRT, if you should so desire to participate.